This is a replica of the German self-propelled anti-tank gun called the Jagdpanzer Marder III Ausf. H 7.5 cm PaK 40/3 Tank Destroyer (Sd.Kfz. 138). The original WW2 vehicle was based on a Czech built LT vs. 38 light tanks that was given the name Panzer 38(t) by the German Army. This vehicle was built on a WW2 Swedish licensed copy of the Panzer 38(t) called a Stridsvagn M/41 tank. 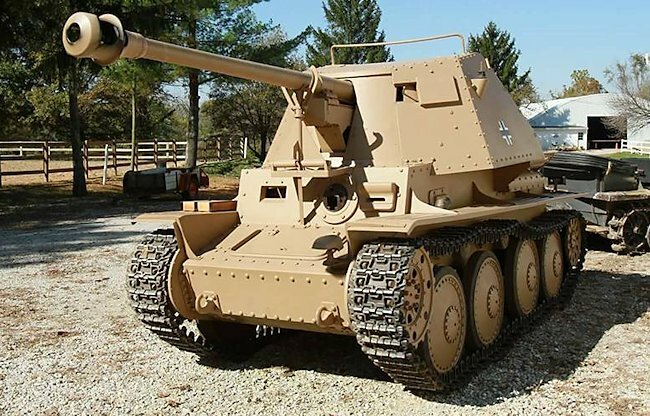 This amazing replica Marder III SPG is in a private collection that is not open to the public. It was built by the Bob Graebe Collection, just outside of St. Louis, Missouri USA, but it can be seen at historical military vehicle events in America. The Marder III Ausf. H self propelled gun was based on a Czechoslovakian built Panzer 38(t) tank chassis which was obsolete in 1942. A standard German 7.5 cm PaK 40/3 anti-tank gun was fitted to a Panzer 38(t) Ausf. H chassis. Unlike the pervious Marder III that used the captured Soviet 76.2 mm field gun, the fighting compartment was in the centre of the vehicle and not at the rear. This enabled the gun crew to stay low in the vehicle. The large side armour gave additional protection. The armour thickness ranged from 10 mm to 50 mm. the rear and top of the vehicle had no armour protection. Because the gun was fitted to the top of a tank chassis it had a hull mounted 7.92 mm MG 37(t) machine gun. The official German Army designation for this SPG was 7.5 cm PaK 40/3 auf Panzerkampfwagen 38(t) Ausf. H, Sd.Kfz. 138. A total of 275 vehicles were built in two series from November 1942 to April 1943. 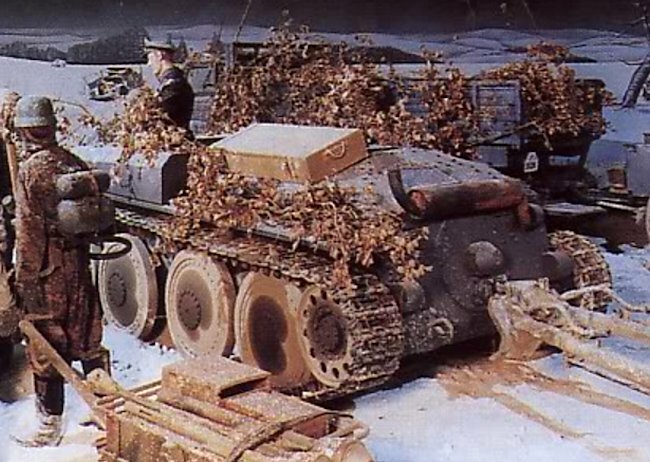 An additional 175 vehicles were converted from Panzer 38(t)'s in 1943. It was powered by a Czechoslovakian Praga Typ TNHPS/II water-cooled, 6-cylinder petrol engine that produced 148 hp. It had a top road speed of 42 km/h (26 mph) and had an operation range of 210 km (130 miles) before refueling. Its chassis hull number is 90150. Originally the chassis was a Swedish built Stridsvagn M/41 S1 licensed built copy of the Panzer 38(t) tank. It was later was converted to a Stormartillerivagn M/43 self-propelled gun as were a majority of these Swedish tank chassis. 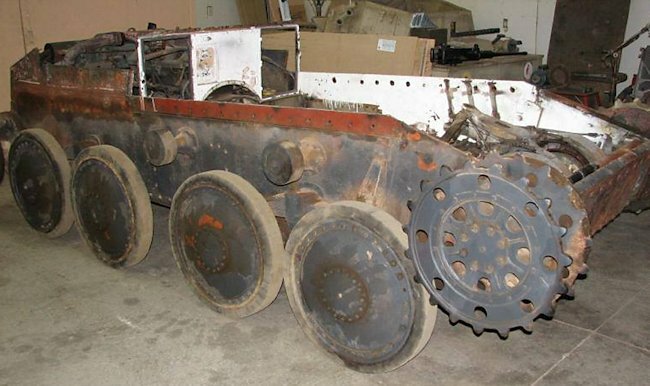 Bob Graebe purchased the chassis from the Arlon Victory Museum in the Belgium Ardennes when it closed. 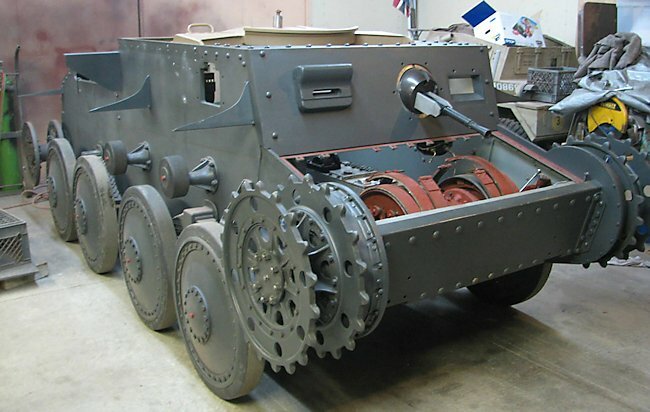 It did not have a turret so the museum had converted it into a ammunition carrier and field gun tractor unit called a Munitionschlepper rather than a Panzer 38(t). It was used in a diorama that depicted the snowy conditions in the battle of the Bulge, December 1944. The Graebe Collection picked up a Stridsvagn M/41 SII turret with another vehicle deal. 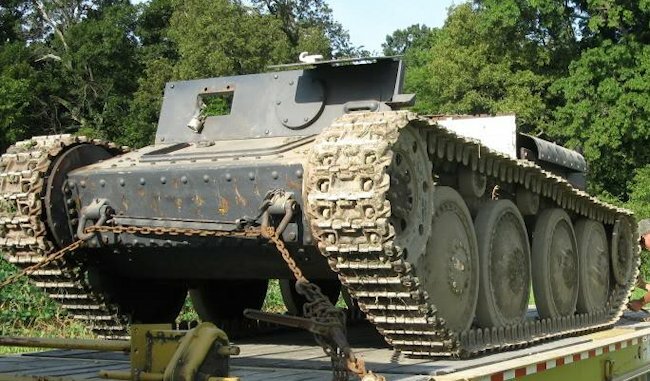 It was at first intended to put the two together to make a tank that looked like a German Panzer 39(t) used in the invasion of Poland, France, Holland, Belgium and Russia. At some point it was decide a Marder III self-propelled anti-tank gun replica would be neat as well. The Collection hoped to be able to convert between the two whenever was necessary but this idea did not work out. Later the M/41 turret was sold and the Collection stuck to the Marder III plan. All of the armour below the mudguards is original to the Swedish WW2 chassis. 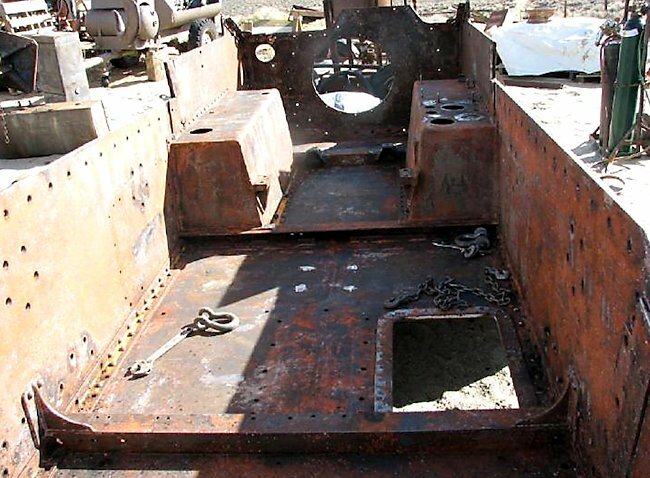 The fighting compartment and upper driving compartment are newly fabricated out of the correct thickness steel. The 7.5 cm Pak 40 gun is an original WW2 German piece. The gun mount that is attached to the chassis is also original. The Graebe Collection was very lucky to find it, as it is unique to the Marder III Ausf.H. The Marder III Ausf. 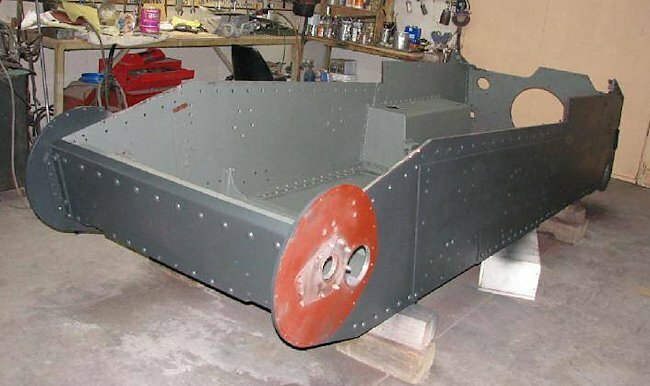 H replica hull before it was stripped of the interior components and external wheels. Most successful of the early Panzerjaegers (Tank hunters) were undoubtedly those based on the Czech built LT vs. 38 light tanks that was given the name Panzer 38(t) by the German Army. The Marder III Ausf. H stripped chassis. Its hull number is 90150. This SPG used was the Russian 7.62cm field gun, with or without muzzlebrake, 78 rounds being carried. All-up weight was about 10.5 tonnes and the crew numbered four. Production started in March 1942 and 344 were produced during that year, most going to Divisions on the Russian front: Infantry formations benefited to a great extent from this added anti-tank protection vehicle. In May 1942, in parallel with developments on the Pzkpfw II chassis, orders were placed for the Marder II to be fitted with the indigenous 7.5cm Pak 40/3. Initially this was again a simple conversion, the Pak 40 being mounted complete With its shield on the hull decking and a tall armoured fighting compartment being built round it. The Marder III Ausf. H hull was stripped, sand blasted to remove the rust, given a coat of primer and then base grey paint. The engine was uprated to 1 50hp and all-up weight became 10.8 tonnes. The first vehicles were delivered in June 1942 and the type continued in production until March 1943, 418 being built . It was replaced by an improved version, the Marder III built using the Panzer 38(t) tank chassis. This was a more comprehensive redesign. the engine being moved forward in the chassis and a new, lower fighting compartment taking its place at the rear. In this form the weapon had a rather more limited traverse but the crew was better protected. The Marder III Ausf. 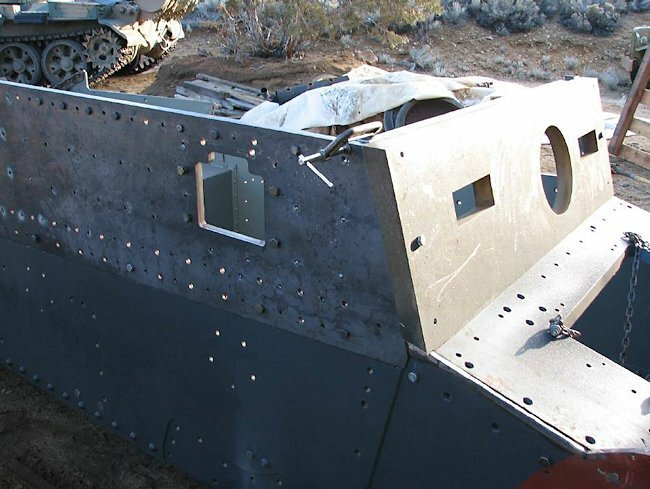 H upper fighting compartment and hull was fabricated in steel to the exact same size as the original AFV armour plate. Many were issued to panzer Division Abteilungen on all fronts and some 799 were produced before production ceased in May 1944. All-in-all the Panzerjaegers on the modified chassis were among the best of their type and production was only stopped in favour of the even better Hetzer Jagdpanzer design. The Marder III Ausf. H replica with drive wheels and road wheels refitted.